NOTE: David McDowell's book is also the center of some controversy within the AP blackjack community. For information on a major critique of the book click here. "David McDowell has written the best book of the new millennium on blackjack advantage play, by quite some distance. The book is a rare combination of creative innovation and intellectual rigor, qualities found in some of the more talented gambling authors but very rarely both together. In time I believe it will be held up as a blackjack classic second only to Thorp's seminal "Beat The Dealer". "The book covers the art of blackjack sequencing, a dark art that even very few gambling professionals truly understand, let alone have mastered. The basic method involves memorizing a string of cards hoping that their order will be partially maintained by the shuffle. Under optimal conditions, this can give you an advantage a card counter could only dream of. The method is both completely legal [and] very difficult to detect." "Although writers like myself, David Morse and Arnold Snyder have hinted at the possibilities of sequencing, McDowell is the first writer to completely explain all of the fine detail required to predict aces successfully, and in a stroke render all other writings on the subject obsolete. Every piece of information you could possibly need to use this extremely powerful technique is contained within. There is no waffle, though the book also uses some entertaining stories by way of illustrating the techniques therein, and is surprisingly readable given the scientific and dry nature of the basic subject matter. The book is worth several hundred times its cover price, and is an essential purchase for the intelligent gambler, particularly those who like to travel, where ace prediction techniques can be used with devastating effect." "David McDowell provides an interesting example of how the game of blackjack can still be exploited by the knowledgeable player. He does an excellent job integrating statistical inference with advantage play theory, and interesting gaming stories. 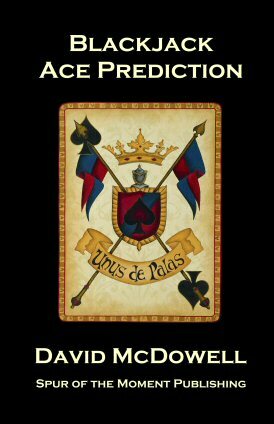 This book is a must read for any player interested in assaulting the casinos by locating and tracking those valuable aces." "Against my better judgement -- an endorsement. Within moments of opening this book for review, I was overwhelmed by two conflicting sentiments, both expressed by the same words: 'Oh my god, he's giving away the secrets!' On the one hand, the information in this book was material I had always hoped to figure out myself some day. Here it all was, laid out in plain and easily understandable terms. The other side was that once out, casinos would take counter measures to insure that these techniques would no longer work. Such information is rarely made public. Please note that we are NOT selling this book, and do not stand to benefit in any way from its sale." "Among its multitude of gems, it gave a very powerful explanation of tracking aces through two common shuffles. As I recall, these were a 2 pass R&R and the stepladder shuffle (used everywhere). There is so much to recommend in this book, that it is an absolute must for every serious advantage player looking to move beyond counting towards much larger advantages. Again, this site gets nothing from recommending this book (it is not even in our store). I am recommending it because it is the first really great new book to have been written in a long time. "The book is fantastic... An immediate classic."